Bridal shower can be filled with joyful laughters if party guests get indulged in some fun filled game. Here is an idea of a game that can be much fun and you can use this stationery that I have made for this game with your own terms and conditions in any creative way that you may like. How to Play: Give each of your party guests a piece of this free stationery for draw a bride game along with a pen or pencil. Now you can play it in many ways, like you can either ask the guests to draw a bride and then ask the bride-to-be to choose the best bride. Or you can make it more fun by asking the guests to put the paper over their heads and then draw a bride. Or put the paper at a distance from each guest so they have to lean to draw on it or put the paper in a way where they can draw on it but can not see it and at the end bride-to-be will select the best bride. You can play this game in any other creative way too that you personally think will be more fun. This is free printable Draw a Bride Stationery design in lilac color. This is a beautiful design with image of a bride and butterflies. To save this image, right click on the image shared above and save the bigger image to your computer. 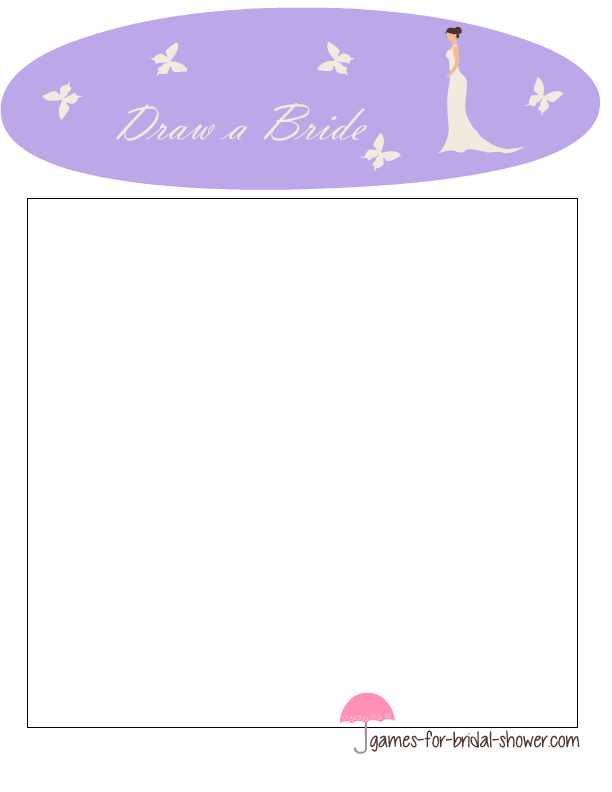 This is stationery design for Draw a Bride Game in Pink color. Just click on the image shared above and save the bigger image. Print it using your home printer if this matches your bridal shower party theme more. This is a very elegant piece of stationery to play draw a bride game.